This is a 4-part series. Part 1 introduces new ecosystem-based adaptation (EbA) research in BC that may inspire a new generation to “think and act like a watershed”. Part 2 will celebrate the 20th anniversary of publication of the seminal research by Richard Horner and Chris May, University of Washington. Part 3 will showcase the results of recent rain garden research by Jennifer McIntyre at Washington State University. Part 4 will conclude with the parallel journeys of Washington State and British Columbia and how the Water Balance Methodology is the foundation for an ecosystem-based approach to protection of hydrologic integrity, and hence creek system resilience. In the late 1990s water resource practitioners in British Columbia, who learned from Washington State research, embraced an “ecosystem-based approach” to integrated stormwater management planning. Although this interdisciplinary way-of-thinking underpinned Stormwater Planning: A Guidebook for British Columbia, released by the Province in 2002, use of the ecosystem term failed to take root in the drainage practitioner culture. Two decades later, however, research undertaken at Simon Fraser University creates a window of opportunity to connect the present to the past, and build on historical knowledge and understanding to educate and inspire a new generation of practitioners to “think like a watershed”and implement ecosystem-based solutions. In 1996, Richard Horner and Chris May (University of Washington) published their seminal research that correlated land use, cumulative impacts and stream health. Their findings shook conventional stormwater management wisdom in the Pacific Northwest to its foundation. Their work became part of the curriculum for cross-border sharing via a workshop series conducted by Bill Derry and Kim Stephens for local governments. The workshops generated interest in the ecosystem-based approach and led to the SmartStorm Forums, four transformational events held between January 1999 and March 2001. 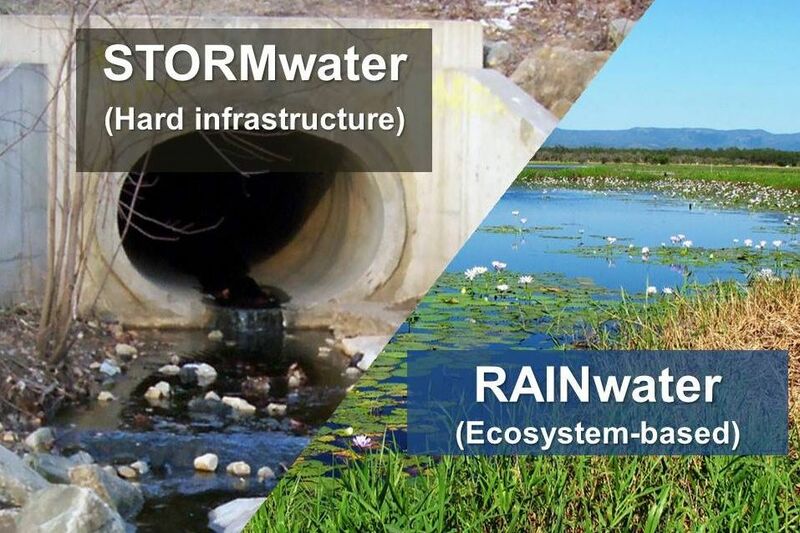 Organized by a partnership comprised of federal, provincial and local governments, the SmartStorm Forums advanced an ecosystem-based approach to stormwater management. 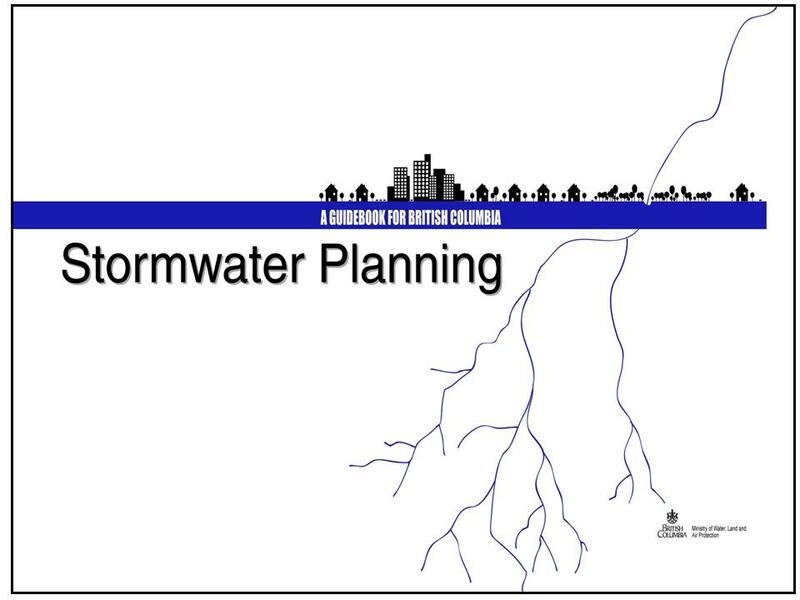 A notable outcome was Stormwater Planning: A Guidebook for British Columbia. 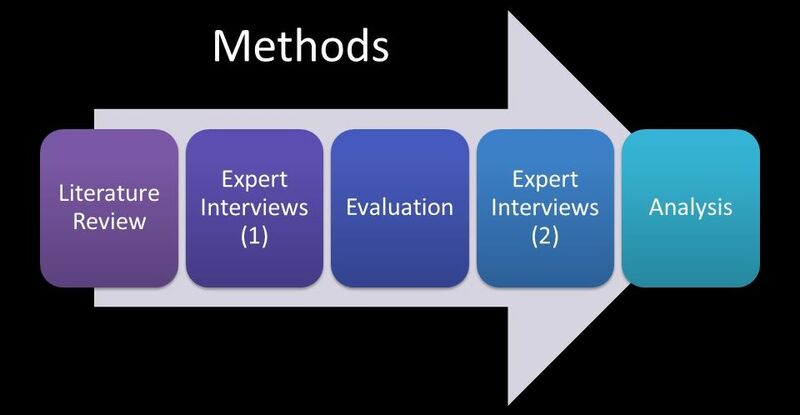 The core concept of the research project, EbA, is a combination of two other significant concepts: EBM (ecosystem-based management) and climate change adaptation. The value of the work by Julia Berry is two-fold: picks up threads from the 1990s; and reminds practitioners to focus on outcomes not output – What does the community want? What is the goal? How will actions restore hydrologic integrity? The presentation was arranged by Kim Stephens, co-supervisor on the thesis committee for Julia Berry’s project. He is the Executive Director, Partnership for Water Sustainability in British Columbia. 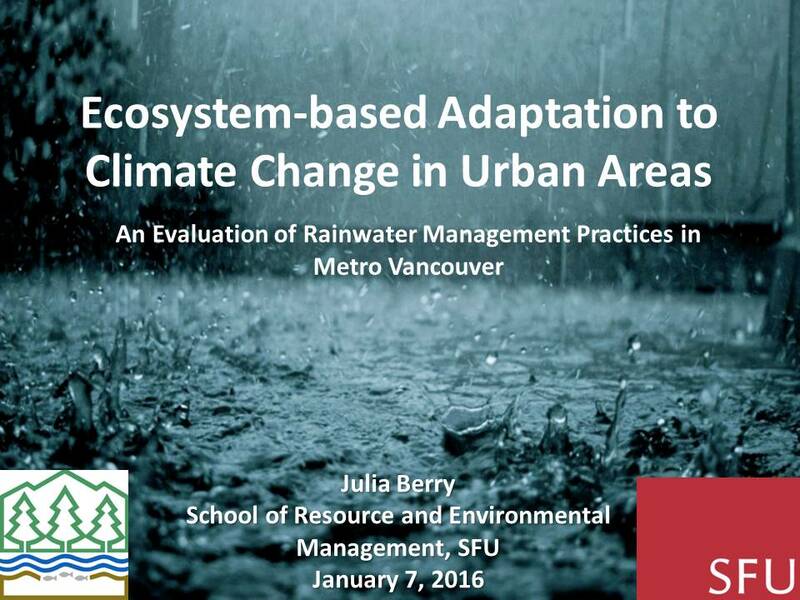 Download a copy of Ecosystem-based Adaptation to Climate Change in Urban Areas: An Evaluation of Rainwater Management Practices in Metro Vancouver, the project by Julia Berry. 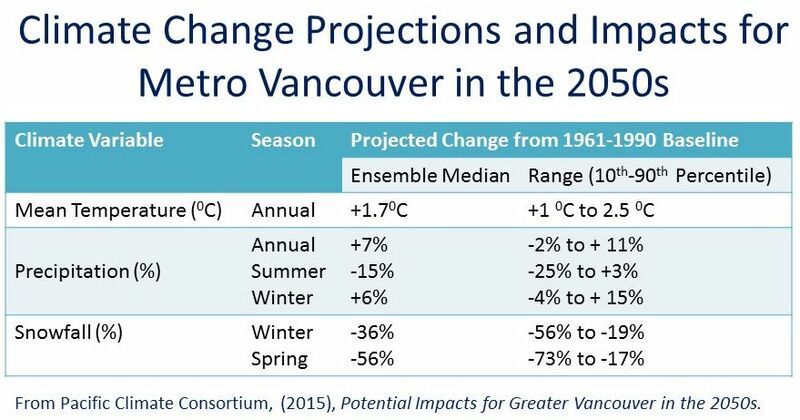 “Adapting to climate change will require a combination of approaches, from man-made infrastructure to holistic approaches. British Columbia’s Stormwater Planning Guidebook promotes a holistic approach to rainwater management, which views rain as a resource and aims to mimic the natural hydrological cycle by allowing rainwater to return directly to the ecosystem,” notes Julia Berry. 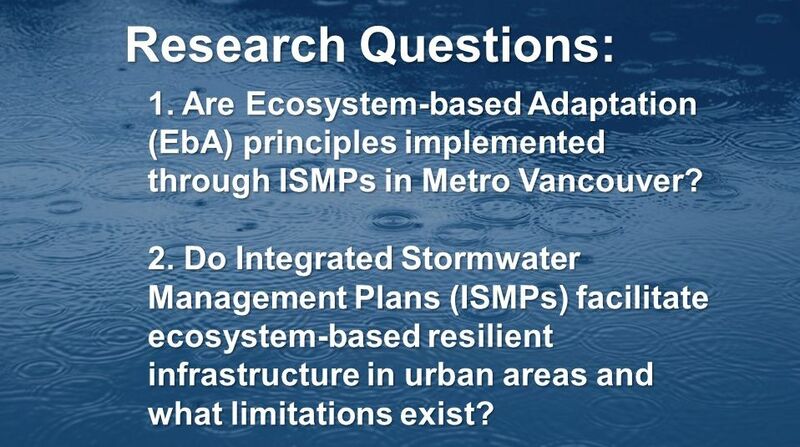 “While the intended purpose of Integrated Stormwater Management Plans (ISMPs) is not directly to address climate change, the results of my research show that these two municipalities are already successfully implementing the principles of EbA through ISMPs in the urban context,” concludes Julia Berry. 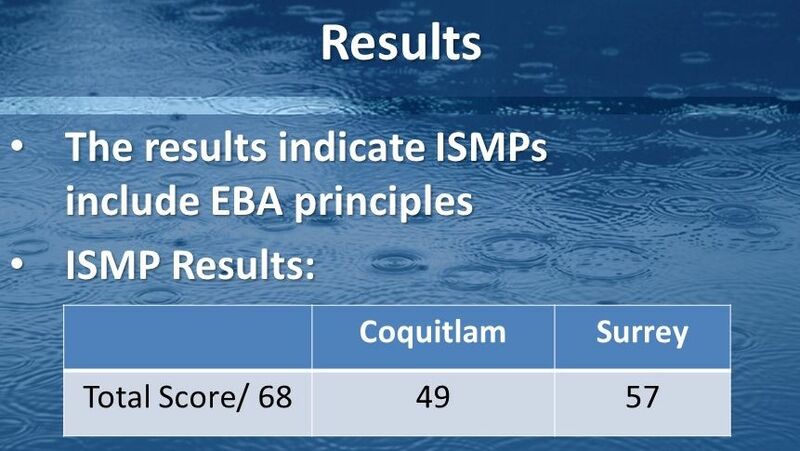 “While the process for developing ISMPs is place-based and is aimed at attaining desired outcomes as opposed to specific practices, the inclusion of EbA principles will also inherently be place-based and likely be reflective of the culture and development requirements of particular municipalities,” concludes Julia Berry. 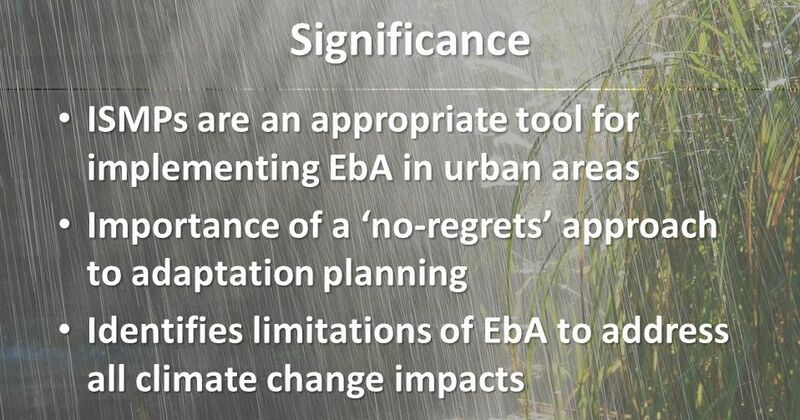 “The research by Julia Berry provides rainwater and adaptation planners with an overview of EbA from principles to practice in British Columbia. The evaluation framework developed by Julia Berry can be used to assess and score the extent to which provincial, regional or municipal documents incorporate EbA principles. The value of her work is that it connects current research to past approaches that have been fallow for more than a decade,” concludes Kim Stephens.